Lugging boxes from the car to her West Chester University dorm on Move In Day 2011, Meghan saw another freshman in similar straits. Ryan’s brain was poring over his new surroundings and the many tasks before him when he felt someone looking at him. He looked back. “When I locked eyes with her, everything slowed down for a second,” he remembered. A couple of days later, Meghan walked by an open dorm door and saw Mr. Cuteness talking to a guy she knew from high school. After a quick hello to the boy she knew, she turned to the one she was really there to see. “Hi! I live down the hall, and my name is Meghan,” she said, launching their slow-burn love story. Meghan Babcock and Ryan Curran and their wedding party. Other than the six months of junior year when she studied in Ireland, Meghan, a political science major who grew up in Springfield, Delaware County, and Ryan, who’s from West Chester and who studied business marketing, were almost always together. Sometimes, they went alone to Rita’s Water Ice or a college bar, but the two landed in the same group of a dozen friends, and most often, they were with the whole gang. Despite their mutual fondness, Ryan and Meghan decided to keep things casual so they could focus on studies, travel, and the college experience. “We knew if we really started dating, it would get serious really quickly,” Meghan said. No one was fooled. “All of our friends would say, ‘You guys are going to get married some day,’ ” Ryan recalled. They dated other people, but it never amounted to much. Little by little, they spent more time as a twosome. Then in April 2015, Ryan visited Meghan at her off-campus apartment. He looked at her meaningfully. “So, we’re doing this, right?” he asked. “All right!” Meghan said. Meghan always made Ryan feel so comfortable. “She never made me nervous, the way other pretty girls did,” he said. “She is the person I can go to a baseball game with and have a beer with, but she is also the person I can bare my soul to.” He also admired Meghan’s closeness with her family and her drive to succeed — which he’s found contagious. “She made me want to be successful in my career,” said Ryan, who now works in medical sales for Independence Blue Cross. In June 2017, the couple bought a home in Springfield, Delaware County. That September, Meghan and Ryan, who are now both 26, adopted a tan-and-gray cat named Sophie. Later that September, Meghan was upstairs getting ready for their usual fall Sunday routine: 8 a.m. Mass with her dad and grandfather, both named Tom, followed by breakfast for four at the Springfield Diner, and then a family gathering to watch the Eagles. Ryan had something else planned. He decorated their enclosed front porch, Meghan’s favorite room in the house, with candles and a photo taken during a trip to Ireland. He had music ready to play. Ryan had a big question to ask before church, but soon it was 7:15, then 7:25, and no Meghan. “What’s going on up there?” he called up the stairs. Meghan, already a little stressed from running late, was annoyed at his veiled rushing. “I’m getting ready!” she said. Ryan’s mind raced. “Some kid vandalized one of our neighbors’ yards! Come see!” he said. “I’ll be down in a second!” said Meghan. Meghan knew something was up. “Where is the picture?” she asked when she saw that the image of the two of them on the cliff next to the Carrick-a-Rede rope bridge was missing from the fridge. After church, the Toms; Meghan’s mom, Denise; her Grandma Grace and Grandpa Vince; and Ryan’s parents, Joseph and Marge, all came over for the game and to celebrate this step in the uniting of their families. The couple wed in a traditional Catholic ceremony at St. Francis of Assisi Parish. 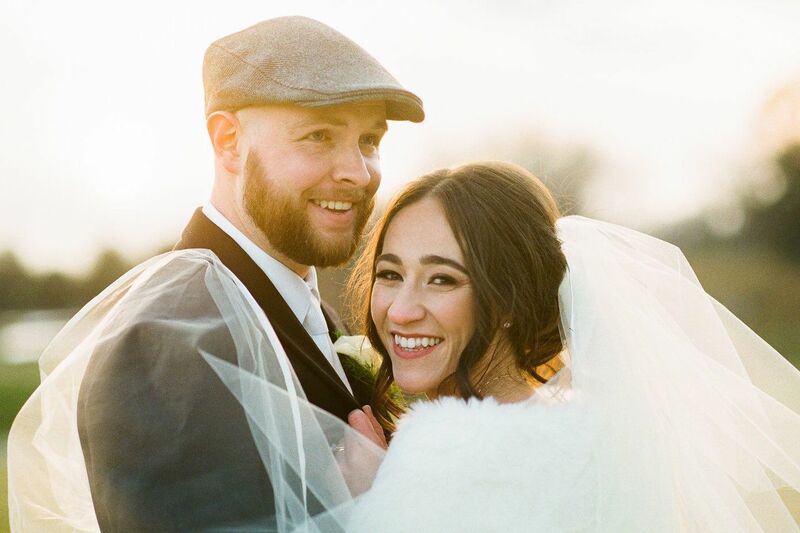 Their wedding day was the Feast of the Immaculate Conception, so Meghan worked with friends Jeffrey Braconnier, who played the piano and organ, and Grace Grassi, who sang, to pick music that honors Mary, Jesus’ mother. A reception for 270 at Springfield Country Club was full of surprises. Meghan surprised Ryan when Merrill Reese’s prerecorded voice introduced the newlyweds and their bridal party entourage. And her dad surprised everyone by singing the song for the father-daughter dance, “Daddy’s Little Girl.” Tom was able to prerecord the song because his brother – Meghan’s Uncle Ed – is lead guitarist in the wedding band that played the reception, This Is: Masquerade. A bargain: Marcus Hook Flowers “had better prices and also better quality than anybody else,” Meghan said. Six days in Williamsburg, Va., where the couple rode on rides bedecked with Christmas lights at Busch Gardens, enjoyed dinners and drinks, and hung out at her parents’ timeshare condo. “It was the most relaxing trip I’ve ever been on,” Meghan said. Officiant: The Rev. Joseph J. Meehan, St. Francis of Assisi Parish, Springfield. Ceremony: St. Francis of Assisi. Reception: Springfield Country Club, Springfield. Ceremony music: Cantor Grace Grassi; pianist Jeffrey Braconnier; violinist Joseph Brennan. Reception music: This Is: Masquerade, Philadelphia. Photography: Ashlee Mintz Photography, Philadelphia. Videography: New Pace Wedding Films, Ardmore. Flowers: Marcus Hook Florist, Marcus Hook. Dress: Designed by Paloma Blanca, purchased at Van Cleve Bridal, Paoli. Hair/Makeup: Lisa Della Penna, hair; Kelly Kirlin, makeup, Blush Salon, Newtown Square. Groom’s attire: Varani Formal Wear, Malvern.